Independent Student Summer Residents have extensive access to our beautiful, 1200 square foot, equipped studio from May - August. 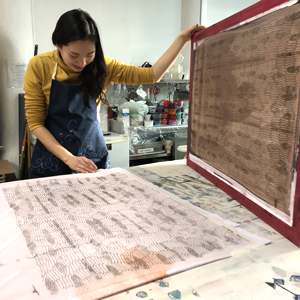 The residency is open to all full-time arts and design students exploring textiles in their work and intending to return to school full-time in the Fall. We offer significantly subsidized monthly studio fees of $50 per week + HST for residencies that are a minimum of 2 weeks long. Benefits may include access to CTS' annual International Visiting Artist summer workshop (July 2019) or other workshops at a significantly reduced rate. The successful applicants will provide their own materials including screens for printing work, fabrics, pigments, dyes, and auxiliaries. Most studio-owned equipment is available for use by Residents with orientation. Residents will supply their own specialized equipment (please note that not all equipment and textile processes can be accommodated in the Studio). Students who successfully complete their residency may be eligible for a Fall/Winter part-time residency while continuing their studies. "It was so lovely to have the space and time to really delve into a specific project of my own choice. Self-directing and having the freedom to set my own schedule was so valuable for me to grow in my practice."